The government is pushing for reform of private kindergartens after some preschools were found to have been involved in alleged corruption and misappropriation of state subsidies. "The association's action is illegal. 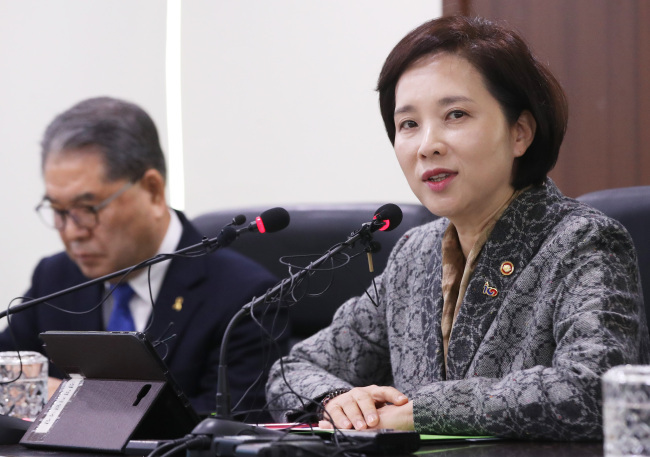 It should immediately revoke its move," Education Minister Yoo Eun-hae said during her visit to an education office in Yongin, south of Seoul. She warned that the private preschools' collective action constitutes a violation of children's right to learn. "The government will cooperate with relevant organizations to minimize parents' inconvenience by prioritizing the protection of children's right to learn," she added. The group said Sunday more than 1,500 member institutions would suspend operations Monday. There are more than 4,200 private kindergartens nationwide and around 3,300 belong to the association. Education authorities said 365 private kindergartens nationwide, including 21 in Seoul, have joined the protest so far. Some 120 other institutions have yet to clarify whether they will hold off on opening. Last year, public uproar was sparked by a ruling party lawmaker's revelation that some preschool owners were guilty of corruption, including accounting fraud, budget misappropriation and other irregularities. Lawmakers authored a set of three bills -- still pending at the National Assembly -- aimed at enhancing the transparency of the operation of private kindergartens. In a related move, the government plans to apply a state accounting system called Edufine, currently used in schools, to private kindergartens starting in 2020. The association is vehemently opposing its adoption as it could put their financial records under government scrutiny. It claims that the liberal government seeks to frame private preschools as "corrupt, criminal" organizations. There was no major chaos in regard to the closure Monday, but parents complained about the group's decision, expressing uneasiness that it is holding their children "hostages" as it presses its demand. Many protesting private preschools provided a care service to look after children without offering regular classes. For children who cannot benefit from this, education offices nationwide kicked off an emergency care service to help look after them at designated public preschools. "I wonder if my daughter can have lunch today," said a mother who brought her daughter to a private preschool offering such a service. "If they do not open tomorrow as well, I am even thinking about filing a complaint against them," she added. The ruling Democratic Party strongly denounced the association's move, calling on its rivals to join efforts to normalize the idle parliament to pass the relevant legislation. "We will sternly respond to its act to take young children hostage for their cause," Lee Hae-chan, chairman of the ruling Democratic Party, told a meeting with party members. DP floor leader Hong Young-pyo urged the government to take strong action against the KKA, including the nullification of its license and criminal punishment.